In April of 2011, my business was at a crossroads. My boutique publicity agency was struggling in the aftermath of the Great Recession. The media landscape was forever changed, thanks to the influence of social media. It was high time to take inspired and imperfect actions to reinvent my offerings to be more relevant in a slowly recovering economy to create a sustainable, satisfying, and rewarding business. It was a tall order, and I journeyed forward – step by deliberate step – to make it real. Truth be told, I was stuck at the front door with a $47 information product – Bye-Bye Boring Bio — and a host of additional products and services that weren’t gaining sufficient traction to make my business flow with ease. I was frustrated that all the pieces of the puzzle weren’t coming together in a business model that worked. To make matters worse, my brand message – Main Street Media Savvy — wasn’t up to date or compelling. The website was cluttered and confusing. I felt overwhelmed by shopping cart technology, sales page design, and administrative details. I didn’t even understand the difference between a broadcast email versus an auto responder. I had never hosted a teleseminar in my life despite being invited to contribute content to the events of others. Most notably, I was feeling discouraged and beaten down by negative self-talk and the economic challenges brought on by the Great Recession. It was a “now or never” decision to get my business model figured out and on a better path. It is often said that "what you measure gets treasured." So, here are some specifics in that regard. My ezine list has grown from 3300 to almost 10,000 within a year. The open rate for my ezines is growing. Sometimes, 30% or more of the people who receive my ezine open it and read it. My blog readership is up 77% over last year. My opt in pages for virtual events are converting far better than ever before. Some convert 75% or better. I’ve become a sought after joint venture partner with an active speaking calendar to influence perfect audiences who can benefit from my message. I’ve learned to attract hundreds and sometimes thousands of perfect participants to my own webinars and those of my joint venture partners. 85% or more of my business comes to me from beyond my Puget Sound backyard. My products, training programs, and services offer "perfect fit" options that meet the needs of spotlight seekers who are serious about the journey to get known to get paid. More of the right people are engaging in these offerings every day. My business is squarely and consistently generating six figures in annual revenue without having to rely on done for you publicity services to make the magic happen month to month. This has not been an easy journey and not one for the faint of heart. And it’s not for anyone looking for an “easy” button. I had to say YES to high level training to get me on the right path to achieve success. What I know for sure is that the biggest shifts of all are those that have taken place between my ears. I’ve got more work to do there, and I’ll keep moving forward, step by step. There will be pot holes in the path to navigate. There will be challenges to overcome. There will be new lessons to learn. What is different now is a sense of greater confidence that the foundation for my business is solid and poised for growth, many systems are in place to support it, and I love the business I have created. That is powerful progress to make in one year’s time. If you would like to take a similar journey with me as your guide, evaluate the Get Known to Get Paid Private Mentoring Program that is gearing up to begin in mid-July. And provided the program offers results that resonate for your own goals to Get Known to Get Paid, complete the intake form and we’ll set up a time to chat. What words do your clients use to describe their pain when they knock on your door? Start listening closely for these "sassy sound bites" so you can start weaving them into your website and marketing copy, your conversations, and your media appearances. It won’t take long for your listeners to tune in and know immediately that you are the perfect solution to whatever is ailing them. And if you and others you know are seeking relief from "the bio cringe," tune in at 10 a.m.PST today for my interview with Christine Kloser about exactly how. Here is the link to register and listen in live or via the recording that will be available to you through Monday. And be sure to tune in to benefit from all the other interviews she has set up to guide transformational authors along their path to make their impact with their books. It’s such a treat to work with remarkable people with compelling stories to tell. Today I am happy to share the newly created story I created for Shelley Miller. She’s up to big things in the arena of home exchange. If you need to learn more about this relevant and affordable way to experience the world, she’s the expert to call. Shelley Miller’s journey to happiness began with a desire to break free from the American middle class rut in which everyone wears watches, but no one has any time. Home exchange served as her vehicle of choice to navigate a world of welcome and wonderful ways to establish enduring bonds with her son, daughter and husband. As they traveled and lived together in homes and neighborhoods across Europe, she learned that everyday moments experienced in extraordinary places were the gifts that allowed her to kick the rut of her prior life to the curb forever. After being locked in a London loo, accused of vandalism in Germany, and threatened by gypsies in Italy, Shelley’s most abiding lesson learned during five domestic and international home swaps is that world peace is within reach, one home exchange at a time. Love, connection, and compassion for others come alive while serving as caretakers to the spaces others call home. The author of the forthcoming book Postcards from Home: One Family, Five European Home Exchanges, Five Months, Shelley’s manuscript earned a Conference Choice Award from the San Diego State University Writers’ Conference in 2012. Through her book, blog, media contributions, and speaking engagements, Shelley share stories, resources, and insights to guide fans and followers to follow their wanderlust to experience the most rewarding experiential travel adventures of their lives. Today Shelly is THE go-to expert families rely upon to learn the keys to unlock home swap as their ticket to experience the world as locals rather than tourists by trading spaces instead of dollars. Home swap is a timely, relevant and horizon-expanding way to experience the world with an open mind that works in concert with today’s new and enduring appreciation for frugality. Shelley wants families everywhere to know that they can enjoy longer and more frequent travel adventures together through home exchange. It’s not a matter of wondering and wishing for more travel. The most relevant question to ask is where to travel next. Born in New Jersey, raised in Nebraska, and Colorado, and a homeowner, wife, and mother of two who has lived in Texas, Hong Kong, and California, Shelley’s passion is traveling the world with her family and enjoying free accommodations. Shelley earned a Bachelor of Art degree in journalism from Colorado State University and a Master of Science degree in executive leadership from the University of San Diego. While serving as executive director for the Red Cross, she contributed to disaster relief efforts in her own backyard and well beyond international borders. Shelley honed her writing skills working in public relations and communications for Coca-Cola Bottling Company and First Texas Bank and served as the executive director for the Red Cross. She also worked in the niche market of book publicity under the tutelage of master publicist Arielle Ford. Have you ever read the bio for a lawyer and remembered what you read to the point where you were in ready to recommend his services even before you met him in person? That is the kind of bio that John O’Grady is now proud to share with his clients. He and I worked together to craft his story. The most important question I asked during our discovery session was this one. What was the moment in your life when you knew this would be the path you’d travel in your career? His answer turned my head and spoke volumes about why he is the best possible athlete to guide clients to resolve their estate battles. John says, “My clients tell me that my new bio is the best they have ever seen.” Best of all, it is telling a story uniquely his own in service to clients who need his particular brand of brilliance. Read on to learn more about Mediator and Estate Planning Lawyer John O’Grady, and get in touch and refer him to those in your world who can benefit. It’s not easy to talk about death, wills, trusts, terminal illness, or loss. Conflicts about family money and elder care can put important relationships at risk. Mediator and Estate Planning Lawyer John O’Grady’s legacy is alive every time he guides people to resolve their conflicts so they stay connected and in conversation for a lifetime. Since 1989, John has successfully mediated hundreds of inheritance, co-ownership, and business disputes. Seemingly insurmountable and unspeakable conflicts come to resolution as a direct result of his attentive listening and thoughtful questions. Described as direct, empathetic, and non-judgmental, John’s persistent, calm demeanor is the foundation from which he skillfully guides people who are stuck in power struggles to come to terms and get beyond their conflicts. John’s path to pursue this work is personal. Soon after law school graduation, John’s sister, husband, and infant son were tested HIV positive. John’s journey through grieving the illness and passing of his sister and husband was the most painful and transformative experience of his life. He is adept at encouraging people to talk about unspeakable issues such as death, legacy and loss. His heart-felt compassion and understanding guide people in conflict to resolutions with grace. There is inherent tension between talking about disagreements and coming to terms. Family mediations often merit more than one meeting as conflicts have usually escalated over time. Participants reach agreements that bring them together over time when they are open to facing traumatic life and death issues and willing to change. This end result is priceless. John owns and operators a full service estate planning law firm. He is chair of The Estate Planning, Trust & Probate Section of the Bar Association of San Francisco. John trains lawyers and mental health professionals in mediation skills for elder care and inheritance. Learn more at ogradylaw.com. 6 of 8 Places at the June 1 Get Known to Get Paid™ Retreat at My Home are Claimed – Does This Event Have Your Name On It? The Get Known to Get Paid™ Intimate At-Home Retreat is coming up on June 1, and six of the eight places at my dining room table have already been claimed by serious spotlight seekers who I can’t wait to meet and enjoy a delicious day of connection, conversation, and collaboration. We’ll be talking about how to Get Known to Get Paid, and I’ll be sharing some of the most powerful lessons I’ve learned along my journey to do exactly that. It’s a day to ask the big questions and the nitty-gritty questions and to meet inspired, action-oriented business owners who are serious about sharing their messages with a much larger audience. If what we’ve brewed up resonates with what you need, claim one of the two remaining places as your own. Here is the link to make that easy. "Mr. Sendak already had been proclaimed ‘the Picaso of children’s books’ by Time magazine when, in his 30s, he wrote and illustrated Where the Wild Things Are. It became one of the 10 best-selling books of all time." That is one compelling statement that speaks to the stunning results he achieved through his work. One review posted to Amazon says this about this beloved book: "Maurice Sendak creates a magical world of imagination where children can escape to the place where the wild things are. The heart of the story is that kids have different ways of dealing with frustrations, but they all have one thing in common – they want to be loved unconditionally, and accepted for who they are." This message will resonate forever for kids and adults of all ages. It sure resonates with me. Rest in peace Maurice Sendak. And if you could write your own obituary today about the impact you are making during your lifetime, could you cull it down to one or two lines of text and say as much? It’s an interesting exercise. Try it, and share your story here. You need a message that excites you and causes your ideal clients to pay attention to what you offer. And, I’ve been hearing from people around the world who want bio wow now, but they are struggling with scheduling or dollars. Here is the GREAT news. You have options to meet your needs and budget. Choose your "just right" way to get what YOU need right now. 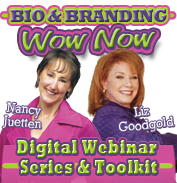 The Bio and Branding Wow Now Digital Webinar Series and Toolkit guides you step by step to create your message that will help you stand out and be remembered in a cluttered marketplace so you can make your impact and attract all the attention, clients, and money you want. We recorded the prior LIVE session of this six-week course and created a digital toolkit that includes all the amazing bio and branding content, the Steeping Hot Seats to showcase the learning, and all of the digital tools to serve as your very helpful guides to get your bio and branding wow now on right now. Practical value is packed within at a price that makes great business sense. Add a one-hour Build Your Buzz Strategy Session with me to refine your bio or work on another issue most important to you to build your buzz so you can attract clients, speaking gigs, and media interviews now. If you want a done for you service, consider your very own Extreme Bio Makeover. I’ll create a story that will excite you and turn heads among your ideal clients. This work takes time and heart, and the price point reflects that. Happy and relieved clients who are tired of wasting their time with less than fabulous stories say it is well worth the investment. What price do you put on making a fabulous winning impression, 24/7? I’d love to work with you, so take a look at these options and make your "just right" choice. I can’t wait to work together in the manner that suits your schedule and budget best.